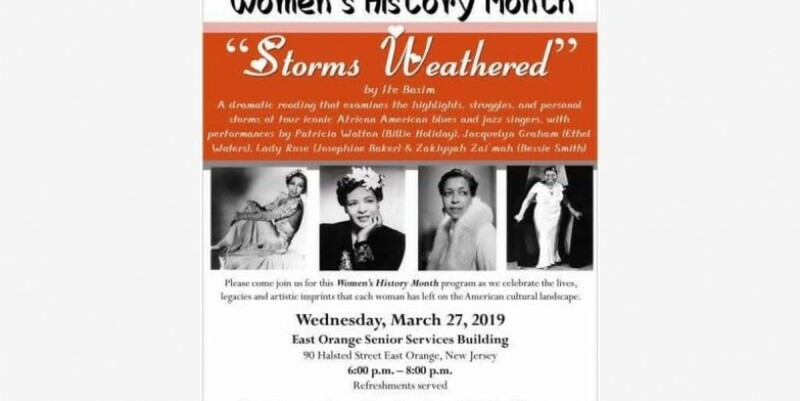 Ife Basim Storms East Orange Senior Citizens , 90 Halsted Street, East Orange , NJ 07018 By Gregory Burrus Join us for an evening of intriguing and interesting conversation at Storms Weathered. Come see this highly recommended Dramatic Reading by Ife Basim Masterpiece - Storms Weathered . This performance is very a intimate, intriguing thought provoking Dramatic Reading honoring 4 Iconic Jazz women during Women's History Month . Portrayed by some of our favorite folks Patricia Walton as Billie Holiday, Jacquelyn Graham as Ethel Waters, Lady Rose ( Ritta Book) as Josephine Baker & Zakiyyah Zai'mah as Bessie Smith and produced, directed by Playwright Ife Basim ( Joy Topping-Mann ). In addition they are real world local Hidden Figures that will be honored during this event Keely Freeman , Florence M. Johnson, Carolyn Ryan-Reed, Alyce West , Nadine Wright Arbubakrr - hence it promises to be a great night out learning a lot about the past and the future while networking with local people making a big difference in the community. Gregory Burrus Around Town photography will be in the house so come on out and enjoy yourself.